The Baker’s Hole site, at Ebbsfleet in Kent, is Britain’s foremost location for evidence dating back to the time when Britain was being colonised by early Neanderthals, some 250,000 years ago. The dig is being supported by English Heritage, Natural England and Lafarge Tarmac, who own the land where Baker’s Hole is located - an old chalk quarry next to Ebbsfleet International railway station. 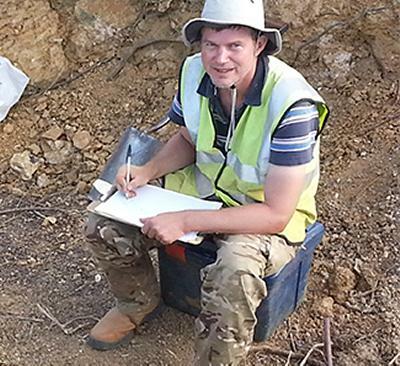 In the latest phase of work, the University of Southampton’s Dr Francis Wenban-Smith has been working to identify where important deposits still survive and to find out what these can still tell us about the period. Stone tools, mammoth teeth and other fossils such as giant deer, bear and lion, have previously been found at Baker’s Hole. Baker’s Hole is also unusual in being one of the very few non-cave Palaeolithic sites on the national list of protected ancient monuments. It is also a Site of Special Scientific Interest on geological grounds. These protections have ensured its preservation in conjunction with the adjacent development of Ebbsfleet International and the High Speed 1 rail link.